The boycott strategy is doomed. GM sold over 9.6 million vehicles last year, but only 288,000 were sold in Canada. That’s only 3% of GM’s global sales, and falls within GM’s annual increases or decreases in sales over the past decade. Instead of the weak power of the individual consumer, the union’s best leverage against GM is the power of workers to bring GM’s production and profits to a screeching halt. It’s how the Flint and Oshawa strikers of 1936-37 won union recognition, and it has remained the best weapon of workers against the company ever since. Just last year, Korean autoworkers won major concessions against GM’s threats to end its Korean operations by threatening mass strikes, conducting illegal job actions, office occupations, and even trashing the GM Korea CEO’s office. Oshawa autoworkers have already held walkouts and sit-down strikes to protest the company’s decisions. Meanwhile, rank-and-file GM autoworkers and supporters in Detroit are rallying around demands for a Green New Deal by taking over the plant and repurposing and retooling it for green production needs. And their campaign, the Autoworkers Caravan, is spreading the word with a video entitled “Make the Green New Deal a Reality”. These demands also make sense in Oshawa, where up to 24,000 direct and indirect jobs rely on the plant. Co-operative ownership and re-purposing the plant would give a lifeline to everyone in Oshawa and Durham Region; pave the way for a new labour strategy to deal with plant closures and massive job losses; and address the problems of climate change and capitalistic ownership. Not only will the boycott fail, but it is a huge gift to Canadian racists. By targeting Mexico, the boycott helps bigots across Canada, from the fascists at the core of Canada’s phony “yellow vest” anti-immigration campaign, to the Scheer Tories, and Bernier People’s Party. All of these groups are following Trump’s lead in stoking racism around immigrants and foreign workers. The right-wing strategy of stoking racism is about distracting from the fact that they don’t offer the working majority a future. They offer no good jobs, no rights to organizing unions, and no solution to climate change, just a war of all against all with the rich and powerful sitting on top. 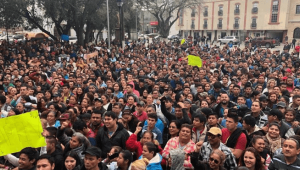 Unifor’s leadership has put the boycott campaign first, and has been late to the game in claiming support for over 40,000 Mexican workers striking against nearly 50 factory owners, including auto parts plants. It has shown no interest in an international campaign to combat the company’s international race-to-the-bottom strategy. Unifor is once again going down the path of bashing autoworkers from other countries, which only allows General Motors to play Mexican, American, and Canadian autoworkers off against each other. Unfortunately now OPSEU has pledged support for Unifor’s boycott campaign. This is a troubling development as it allows other Canadian unions space to jump on the bandwagon. And now the American United Auto Workers is supporting the boycott. UAW is no stranger to this kind of campaigns. 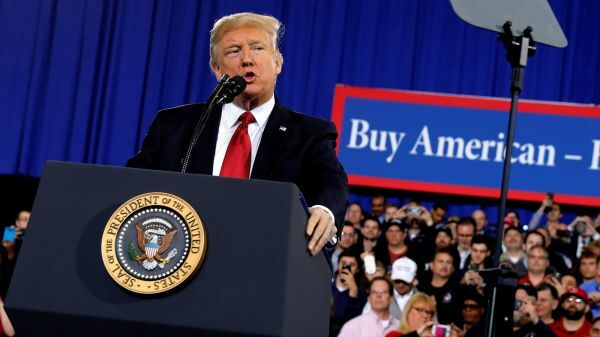 They helped pioneer the “Buy American” campaigns in the 1970s when employers launched a new aggressive offensive against the unions and labour power amidst new economic crises, and growing global competition. Not only did Buy American fail, but these campaigns have always had a racist component to them. Even before “Buy American” became a project of organized labour, reactionaries like William Randolph Hearst whipped up hysteria against Japanese imports during the early days of the Great Depression. This helped to build public hostility towards Japanese-Americans, laying the groundwork for their WW2 internment in concentration camps. In the 1980s, there were plenty of examples of American workers committing acts of vandalism against Japanese cars. In the most extreme example, Chinese-American Vincent Chin was murdered by an auto plant superintendent and a laid-off autoworker because they thought he was Japanese. In the age of President Trump and a resurgent far right around the world, being concerned about the situation spiraling to these extremes is warranted. This mess of a response should be seen in contrast with Unifor’s strategy during the NAFTA renegotiations that led to the United States–Mexico–Canada Agreement (USMCA). During the lead up to USMCA, Unifor took a generally continentalist and internationalist position. They worked closely together with Mexican and U.S. unions and highlighted the issue of labour rights in Mexico, particularly the issue of corrupt unions that were basically PRI patronage machines that members had little control over. The leadership’s about face shows that it lacks the confidence, capacity and ideas to build a movement across borders. Over 40,000 Mexican factory workers at nearly 50 plants have been striking for better wages and conditions. At least 27 employers have agreed to 20% wage increases. The auto industry has been internationalized for decades, but Unifor has gone the opposite direction. Retreating into a nationalist consumer boycott is already an admission of defeat. The impact of any Canadian boycott will be negligible to GM’s bottom line, but most destructively, it is laying the groundwork for workers to be won over to the no-future politics of the reactionary racist right. 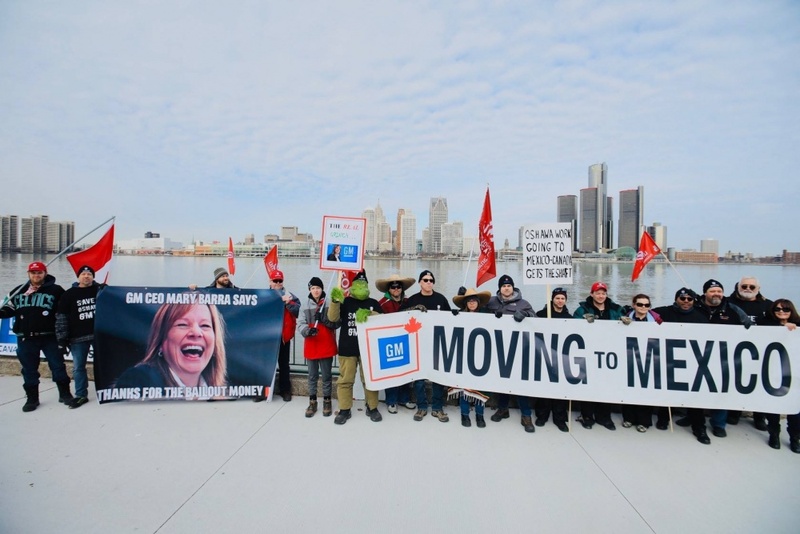 Backed up by real threats of coordinated strike actions, occupations and expropriation of the plants, only an international strategy across borders – and across company lines – is going to seriously challenge General Motors and provide a future for GM Oshawa. Now is the time for us to embrace the demands of a Green New Deal.